The site of Coal City was originally settled around 1885 when it was called Oak Springs Bench and later, Cedar Mesa Ranch. It was bounded on the west by the Gentry Mountains and Gordon Creek ran through the town. 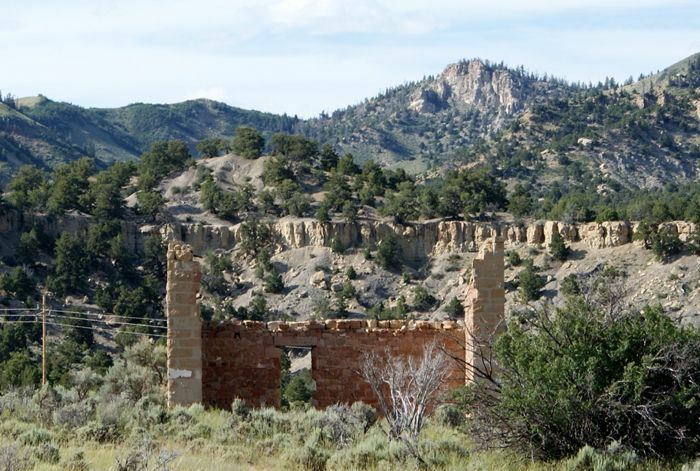 However, early settlers found the 7,000-foot elevation unsuitable for farming and ranching and soon moved on. 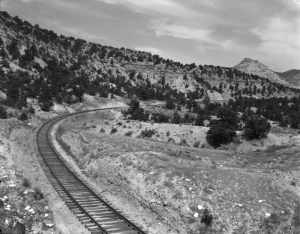 When coal was discovered in the area, small-scale mining began, but due to the town’s distance to the nearest railroad, it was never a huge success. A small town was established George A. Storrs who had visions of a booming mining community. In August 1921, an official town was platted and named Coal City. The Great Western Coal Mines Company was incorporated in October 1921 and coal shipments began a few years later, hauled by wagon to the nearest railroad. In 1822, the Andreini and Calzani building was constructed and used as an office for the Great Western Company until 1925. Afterward, it was utilized for a mercantile business by Eugene Androni, called Andreini’s Store. During 1923, Jack Dempsey, the famous heavyweight fighter, was training in Coal City and as locals tried to get him to invest in the mining operations, the town was frequently referred to as “Coal City with a punch behind it,” which soon grew into Dempseyville or Dempsey City. However, when Dempsey didn’t invest and moved on, the town name reverted to Coal City. The mine got a reprieve when the National Coal Railway began to build to the town in 1923-1924. The railroad also extended to other mines of the Gordon Creek District. Though the city was primarily made up of tents, school was first held in a log cabin in 1925 and the following year, a new cement block schoolhouse was built, which housed about 24 pupils. A mercantile store and bakery were also constructed and many of the tents were replaced with permanent housing. In 1926, H.J. Fisher was elected Justice of Peace, and Robert Mack, Constable of Coal City. By that time, the townsite had been laid off in an attractive manner which offered possibilities to the miner for his own home and garden plot. Electricity and an ample water supply were also available. However, the mine was seemingly doomed from the beginning. The company’s president, George A. Storrs was indicted for mail fraud for soliciting bond investments through the U.S. Mail. Though he was cleared of the charges in 1926, the mining company was struggling and the same year went into bankruptcy proceedings. By December, the mine had discontinued operations. Mining resumed in October 1928 and continued intermittently until coal production began to decline in 1935. The town was abandoned by 1940. The town’s population was primarily made up of foreign immigrants, which peaked at about 70 people. Today, there are just a few buildings left at the site, which is now part of the Gordon Creek Wildlife Management Area. It is still accessible and stairs are provided to get over the fence, however, no motor vehicles are allowed in the area. Deteriorating structures and old water systems can still be seen. Coal City is located about nine miles west of US-6/191 on Consumers Road (UT-290/139).